Swedish illustrator Eric Palmquist (1908-1999) was a gifted artist whose sketch-style pen and ink drawings are comparable to artwork created by the most talented production designers and story board artists that I knew at the Walt Disney Studio. 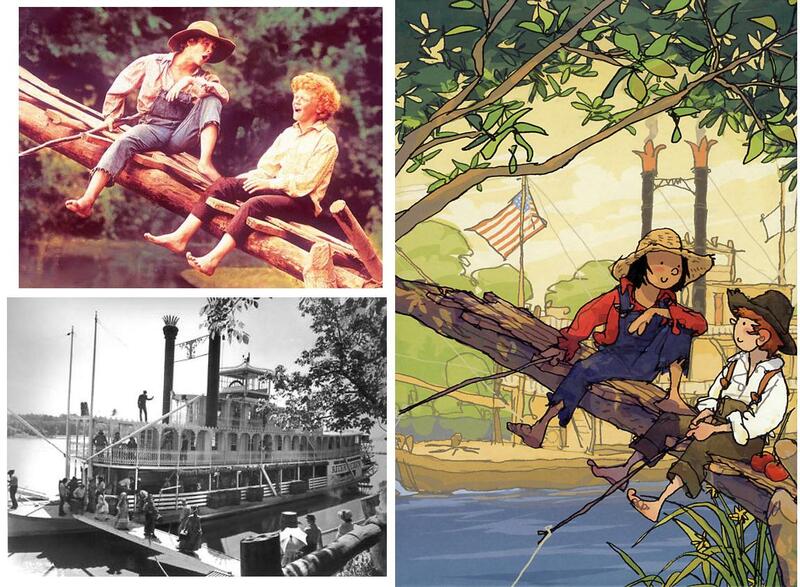 Palmquist illustrated both of Sam Clemens' classic boyhood on the Mississippi novels: TOM SAWYER in 1956 and HUCKLEBERRY FINN in 1957 for Tidens Bokklubb of Stockholm, Sweden. Palmquist's human and animal characters were outstanding, drawn with great spontaneity, personality and humor. 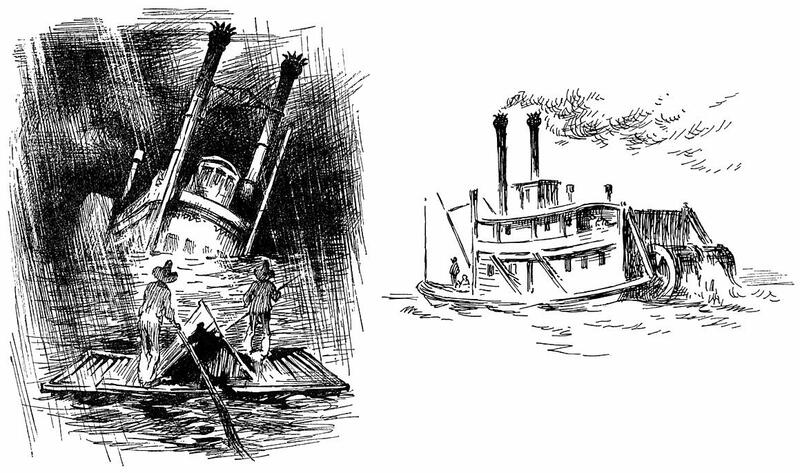 Attached two of Palmquist's steamboat drawings for HUCKLEBERRY FINN. The one on the left of Huck and Jim on their raft approaching the wreck of the steamboat WALTER SCOTT on page 77, the sternwheeler is from page 131. Palmquist's illustrations are reminiscent in some respects to the pen and ink drawings by E.W. Kemble for the first edition of HUCK FINN that was published in 1884. 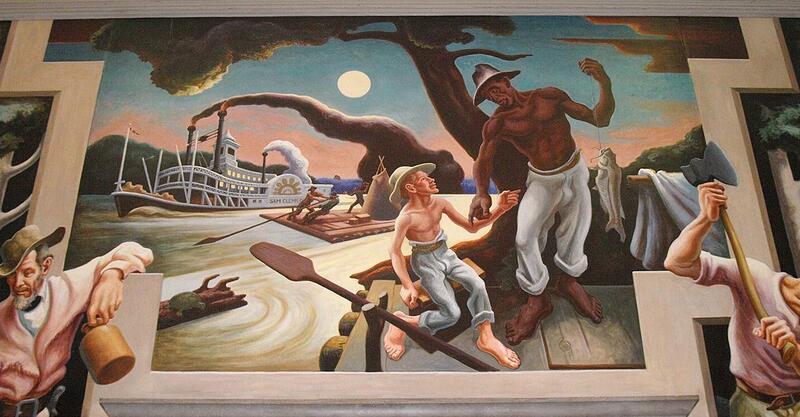 Huck Finn and Jim on their raft from one of Thomas Hart Benton's murals in the Missouri State capital at Jefferson City. Attached detail of the steamboat from the upper right hand corner of Benton's lithograph of his Missouri State capital mural in Jefferson Ctiy which included Huck Finn & Jim. Benton's lithograph is a mirror image of the mural. 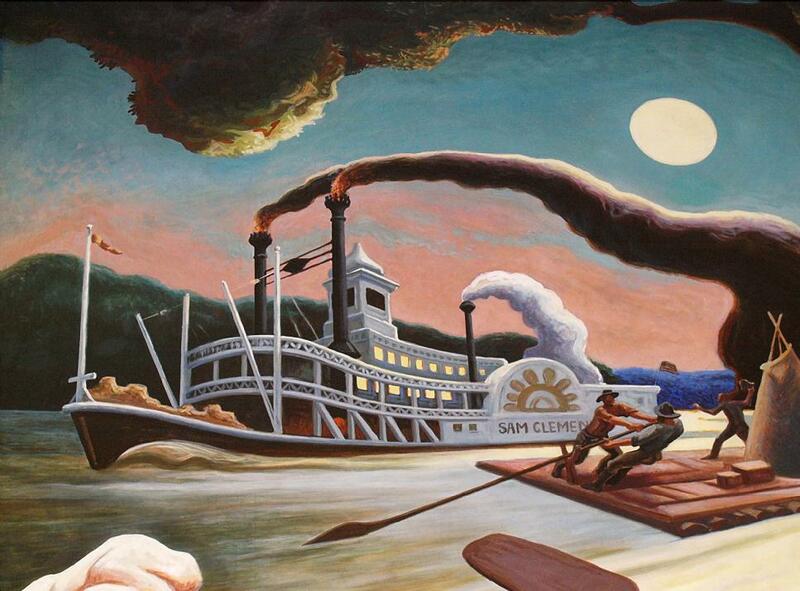 In the mural the name of the boat on the paddle box is SAM CLEMENS. An illustration which appears on the front cover and page 15 of a new German translation from last year of Mark Twain's 1896 novel "Tom Sawyer, Detective as told by Huck Finn." You can barely make out a square Confederate flag flying from the stern of the steamboat. In an illustration of a courtroom scene on page 89 there's a much more conspicuous Confederate flag hanging on the wall behind the Judge. I gather artist Jan Reiser assumed that during the 1850's (when the story takes place) Arkansas was already a Confederate state. The swinging stages on the front of the boat weren't introduced on the rivers until after the Civil War. The bulkhead angled over the paddlewheel may be the illustrator's concept for a "splash guard" to keep passengers and crew dry while the wheel is turning. "Tom Sawyer als Detektiv : erzählt von Huck Finn"
Huck Finn begins Chapter 2 with an account of how he and Tom Sawyer book passage from St. Petersburg, (Hannibal) Missouri down the Mississippi to Tom's uncle Silas Phelps' Arkansas farm where Huck's runaway slave friend Jim had been held prisoner during the previous Spring in the last chapters of Mark Twain's "Adventures of Huckleberry Finn." We had powerful good luck; because we got a chance in a stern-wheeler from away North which was bound for one of them bayous or one-horse rivers away down Louisiana way, and so we could go all the way down the Upper Mississippi and all the way down the Lower Mississippi to that farm in Arkansaw without having to change steamboats at St. Louis; not so very much short of a thousand miles at one pull. A pretty lonesome boat; there warn't but few passengers, and all old folks, that set around, wide apart, dozing, and was very quiet. We was four days getting out of the 'upper river,' because we got aground so much. But it warn't dull--couldn't be for boys that was traveling, of course." Andy Thomas of Carthage, Missouri has painted Huckleberry Finn and Jim on their raft on the Mississippi with a full moon in the cloudy night sky above them. The steamboat on the right bears the name "S.L. CLEMENS," the actual identity of Huck and Jim's creator Mark Twain. The attached image is a detail of the painting. Detail of Andy Thomas' painting HUCK FINN . . . this is a detail of the left half of the canvas with approaching steamboat on a moonlit night and Huck with runaway slave Jim on their raft. 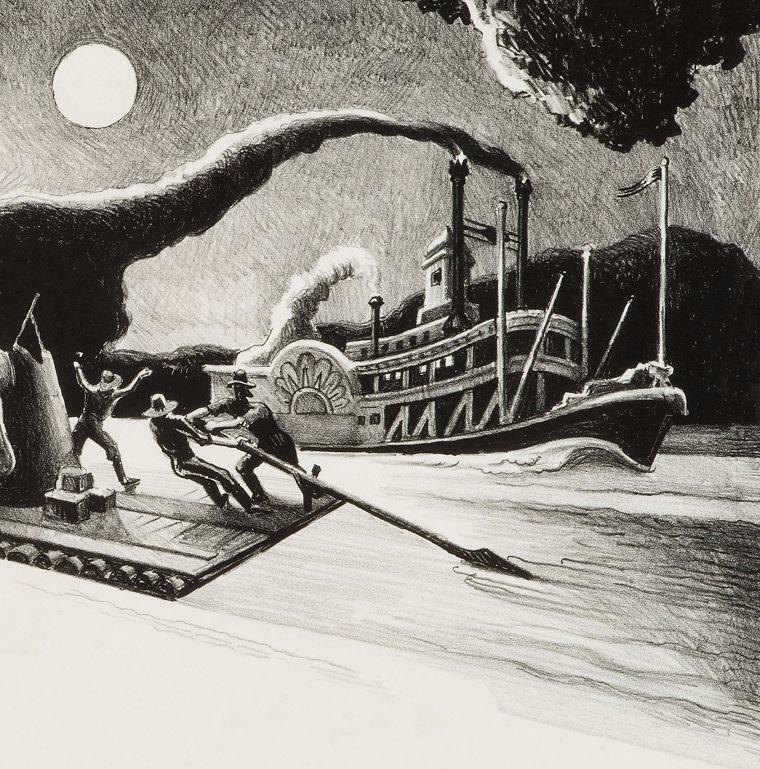 Attached detail from the 18x36 giclee print on paper of HUCK FINN which features Huck and Jim on their raft in the middle of the Mississippi on a moonlit night. This is the boat in the upper right quadrant of the painting, given Mark Twain's real name S(amuel) L(anghorne) CLEMENS. 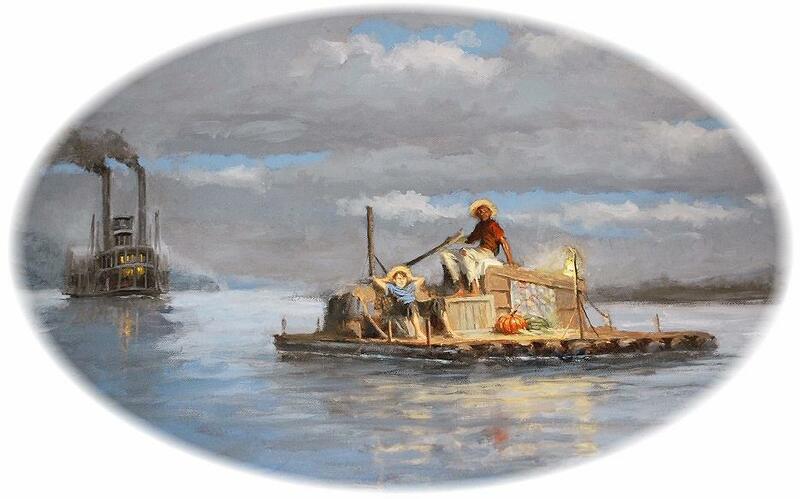 Beautiful artwork, really evokes those antebellum days on the river. After 35 days in transit from Lithuania I received a unique Russian edition of Mark Twain's TOM SAWYER published in 1992 and illustrated by Nicholas Bayrachny who in 1996 also illustrated a Russian edition of Tolkein's THE HOBBIT. 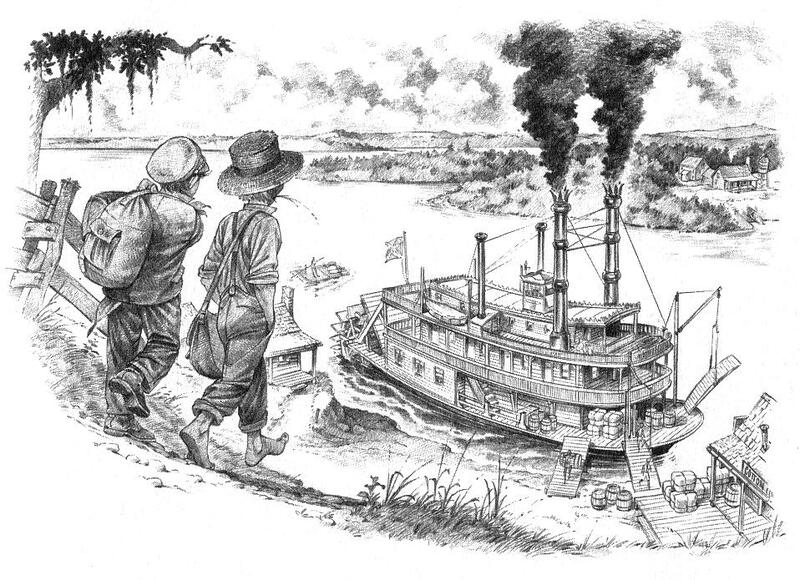 Attached scans of Bayrachny's illustration of the steam ferry boat that Tom Sawyer, Huck Finn and Joe Harper observe from their hiding place on Jackson's Island where they ran away to "play pirate" along with the front cover of this edition. 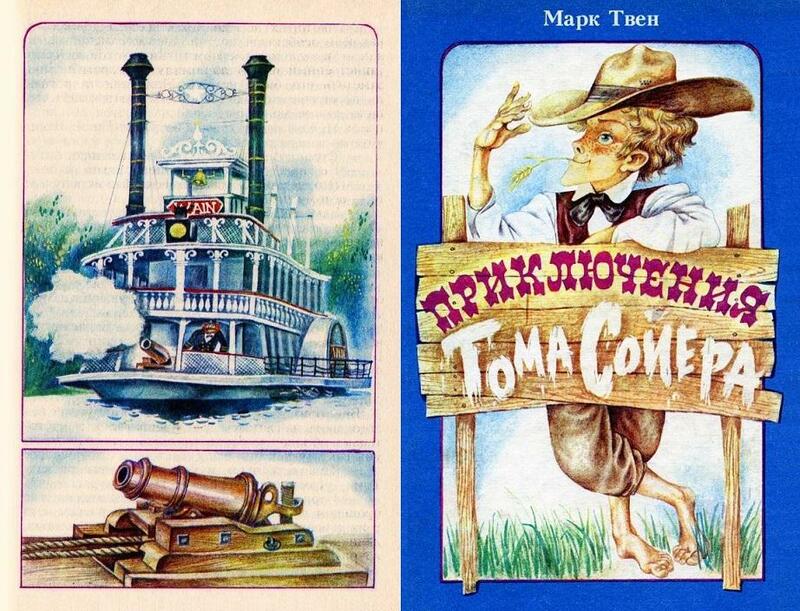 It's apparent that Bayrachny based his steam ferry boat on a photograph of the steamboat MARK TWAIN that runs on the Rivers of America at Frontierland in Disneyland theme park. On the pilot house are the the last 4 letters of the pen name Sam Clemens used "WAIN" (minus the "T" at the beginning of the word). The citizens of St. Petersburg (the fictional name that Sam Clemens gave to his hometown of Hannibal, MO in his Tom and Huck novels) assume that the three missing boys may have drowned in the Mississippi River and send out the local ferry boat to search for their bodies.The 1840's methods to get a drowned body to rise to the surface of the river are described in the excerpt from TOM SAWYER below. 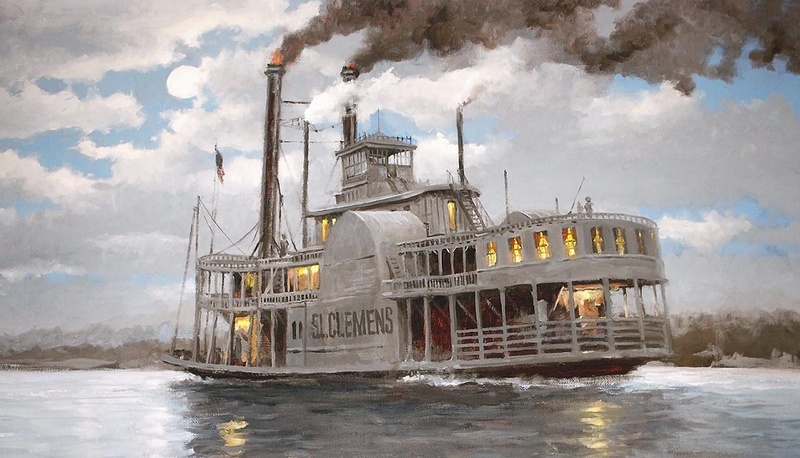 The artist converted the MARK TWAIN from a sternwheeler to a sidewheeler and reduced the number of people on board from a "crowd" to a one man dressed like a Captain who's firing the cannon from the prow of the boat rather than the side. Nicholas included a nice detail of the nautical artillery at the bottom of the page. The little steam ferryboat was about a mile below the village, drifting with the current. Her broad deck seemed crowded with people. There were a great many skiffs rowing about or floating with the stream in the neighborhood of the ferryboat, but the boys could not determine what the men in them were doing. Presently a great jet of white smoke burst from the ferryboat's side, and as it expanded and rose in a lazy cloud . . . a dull throb of sound was borne to the listeners . . .
"Boys, I know who's drownded—it's us!" 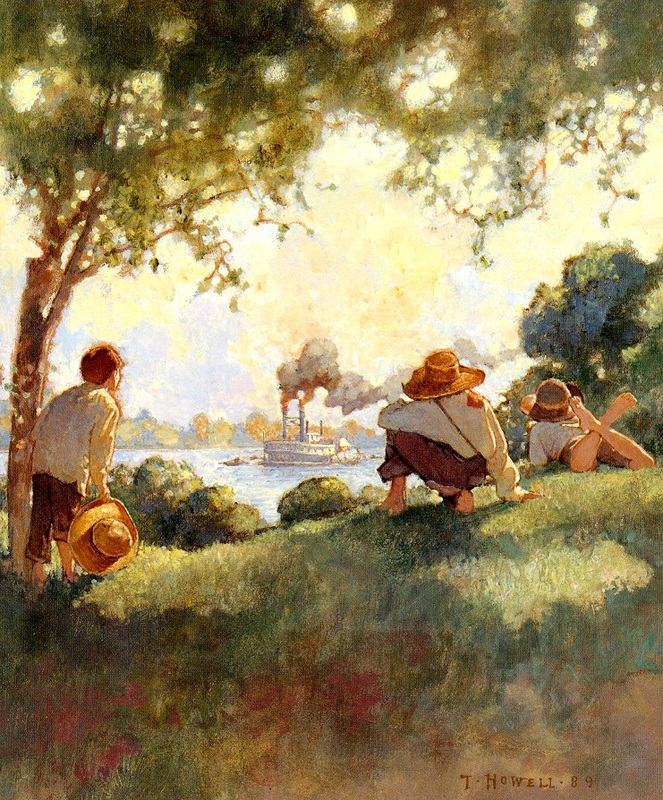 Attached an illustration from TOM SAWYER painted by Troy Howell in 1989 that depicts the same scene from the novel that Russian illustrator Nicholas Bayrachny created in 1992. Attached matched pair . . . Thomas Easterly's 1853 daguerreotype of the St. Louis levee (in the collection of the Missouri Historical Museum) and an original color illustration painted by British artist John Worsley for a 1984 Exeter Books abridged addition of Mark Twain's TOM SAWYER (Tom is sitting on the fence and Huck Finn standing by) with the steamboats in the background based on the 1853 image. 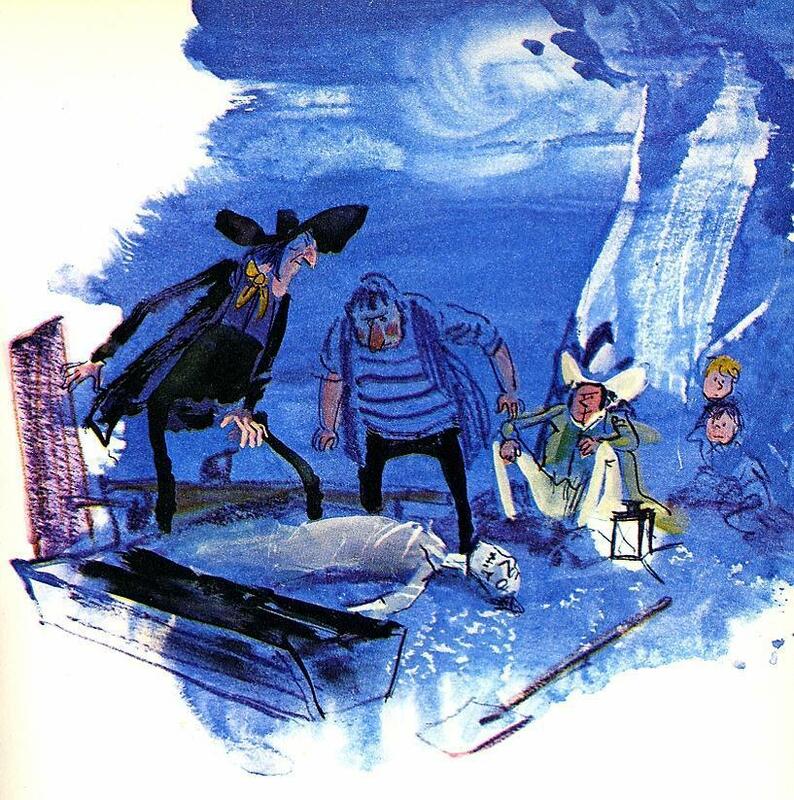 Horst Lemke's watercolor of the "Graveyard" scene in a German edition of TOM SAWYER is brilliant. "Here, now, don't you hit my pard!" and the next moment he had grappled with the doctor and the two were struggling with might and main, trampling the grass and tearing the ground with their heels. Injun Joe sprang to his feet, his eyes flaming with passion, snatched up Potter's knife, and went creeping, catlike and stooping, round and round about the combatants, seeking an opportunity. All at once the doctor flung himself free, seized the heavy headboard of Williams' grave and felled Potter to the earth with it— and in the same instant the half-breed saw his chance and drove the knife to the hilt in the young man's breast. He reeled and fell partly upon Potter, flooding him with his blood, and in the same moment the clouds blotted out the dreadful spectacle and the two frightened boys went speeding away in the dark. "That score is settled— damn you." Then he robbed the body. After which he put the fatal knife in Potter's open right hand, and sat down on the dismantled coffin. Three — four— five minutes passed, and then Potter began to stir and moan. His hand closed upon the knife; he raised it, glanced at it, and let it fall, with a shudder. Then he sat up, pushing the body from him, and gazed at it, and then around him, confusedly. His eyes met Joe's. "I thought I'd got sober. I'd no business to drink to-night. But it's in my head yet— worse'n when we started here. I'm all in a muddle; can't recollect anything of it, hardly. Tell me, Joe— honest, now, old feller— did I do it? Joe, I never meant to— 'pon my soul and honor, I never meant to, Joe. Tell me how it was, Joe. Oh, it's awful— and him so young and promising." "Why, you two was scuffling, and he fetched you one with the headboard and you fell flat; and then up you come, all reeling and staggering like, and snatched the knife and jammed it into him, just as he fetched you another awful clip— and here you've laid, as dead as a wedge til now." "Oh, I didn't know what I was a-doing. I wish I may die this minute if I did. It was all on account of the whiskey and the excitement, I reckon. I never used a weepon in my life before, Joe. I've fought, but never with weepons. They'll all say that. Joe, don't tell! Say you won't tell, Joe— that's a good feller. I always liked you, Joe, and stood up for you, too. Don't you remember? You won't tell, will you, Joe?" And the poor creature dropped on his knees before the stolid murderer, and clasped his appealing hands. "If he's as much stunned with the lick and fuddled with the rum as he had the look of being, he won't think of the knife till he's gone so far he'll be afraid to come back after it to such a place by himself — chicken-heart!" Cover art for a 2008 Spanish language adaptation of "Las aventuras de Tom Sawyer," the ninth and last of a series of abridged literary classics for children published by La Galera in Barcelona, Spain as the 9th and last in their "pequeños universales" series. Mark Twain's novel was adapted to 36 pages by Xosé A. Neira Cruz with 18 illustrations (including the cover) by Javier Andrada. They were from the 1973 musical film adaptation of TOM SAWYER with Jeff East (left) as Huck Finn and Johnny Whitaker (right) as Tom Sawyer. The steamboat was the JULIA BELLE SWAIN, was renamed the "River Queen" for the movie.